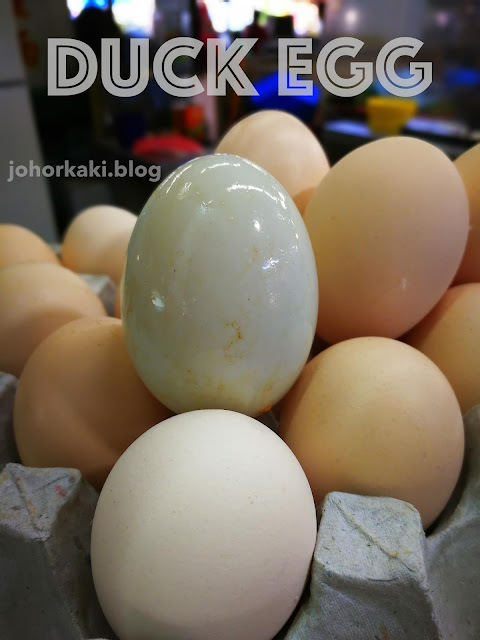 I have been asked many times by Singaporeans on where to get pork or duck blood curd, duck egg, wild boar and other food banned on the sunny island. Planning a day trip for buddy Milton, I decided to put together a JB trail of Singapore banned food - I shall call it the Forbidden Food Trail of Johor. 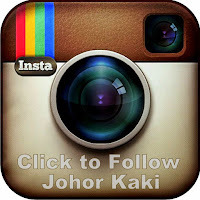 The trail shall keep to just JB and Pontian so that it can be done as a day trip from Singapore. Rong Shu Xia 榕树下粿条仔 near Plaza Pelangi for pork blood curd (Jalan Maju 🕙 6:30am - 12 noon Weds off). 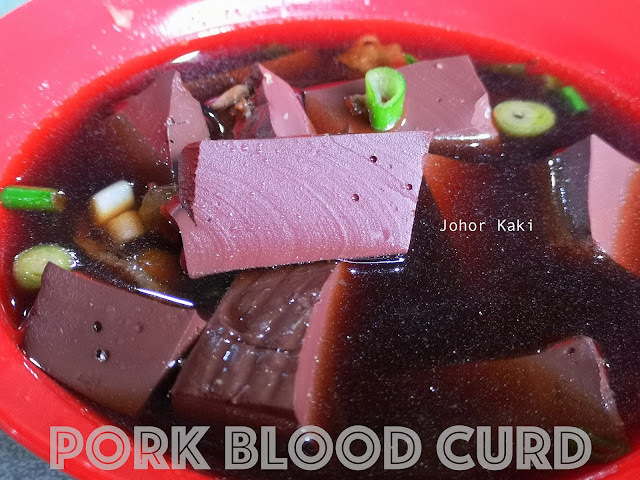 RSX is one of JB's popular kway teow kia shops and it usually has a stock of pork blood curd. The shop opens at 6:30am, so it's a good place for early birds to start their trail. Just 3 minutes drive from RSX at Cedar Point food centre, there is Meng Fang kway teow kia where you can also get pork blood curd. Meng Fang (🕙 6:30am - 2pm Thurs off) is also an early starter, so it is a good alternative to RSX. 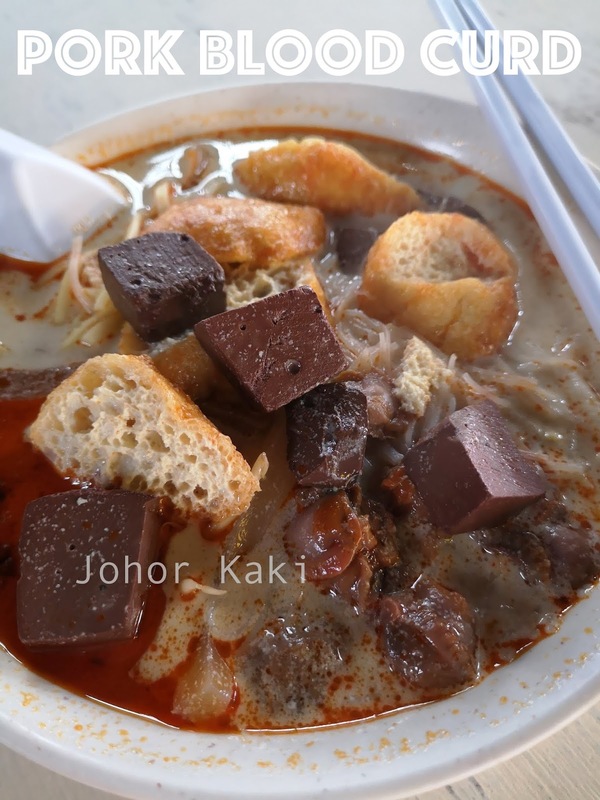 At the 国记 Penang food stall at Johor Jaya's Family Food Court (🕙 6am - 2pm Weds off), you can get pork blood curd with Penang style curry mee which get three thumbs up even from Penangites. Pick up a litre bottle of toddy in downtown JB at Jalan Sulaiman (🕙10am - 4pm). The bad thing for early birds is, because the shop opens only at 10am, you are stuck around town till 10am (if you must have your toddy fix). The good news for late starters is, you can swing by the toddy shop first to have your toddy here, or take away your litre bottle of sweet sourish coconut wine to pair with your blood curd or wild boar meat lunch. Double shot duck egg fried kway teow at Dwi Lapan kopitiam in Tun Aminah (Jalan Phalawan 2 🕙 7am - 3pm Fri off). This fits in nicely on the way to Pontian for wild boar meat. 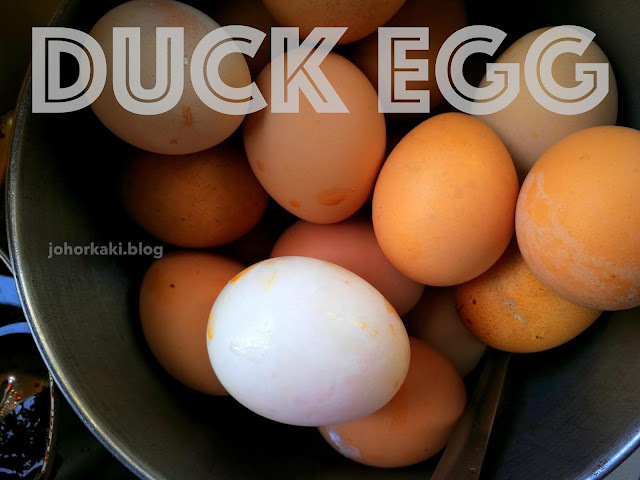 Ask for a double shot of duck eggs for more duck egg flavour (I mean 2 eggs, not 2 plates) - might as well right? 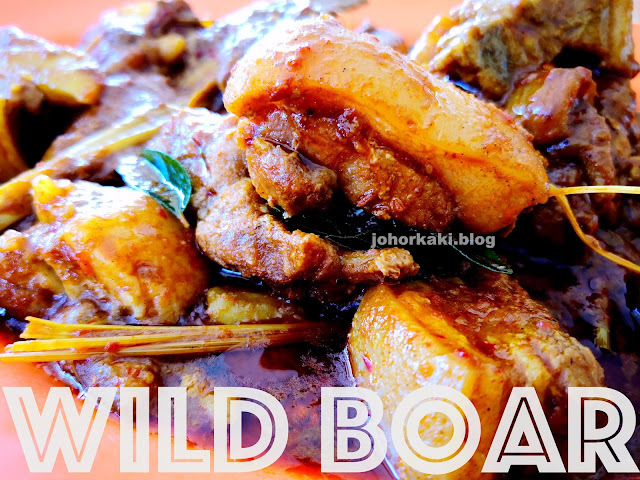 Wild boar in Pontian (Jalan Kukup 🕙 11am - 5pm). This is my favourite place for wild boar in Johor. Their "melon boar" when it is available is comparable to Iberico pork in texture and just as sweet, I kid you not. The eatery is actually in the verandah of a private home in rural Pontian, so that is itself a unique dining experience for city folks. Call Mr or Mrs Chuang at ☎ +6012 765 2782 before coming - it's 1.5 hours drive from JB town, so don't want to have a wasted trip. Fa Shao wild boar meat in Taman Ungku Tun Aminah (Jalan Temenggong 11 🕙 5:30pm - 11pm Tues off). Back in JB from Pontian, if you need more wild boar, swing over to TUTA near 777 Food Court for more curry wild boar or wild boar in peppery soup for a change. Made with 胡椒根 pepper root, it has sharper heat than any peppery bak kut teh in Singapore. If you are back in town by the evening, you can get another shot at duck egg char kway teow at stall #63 at Sri Tebrau Hawker Centre (Jalan Keris). Again, go for double shot - it's your last chance before heading back to the sunny island. This post will be updated from time to time with more Singapore banned food.